The Lebanese community in Kano has exonerated itself from the large consignment of arms uncovered by the Nigerian security agents in the troubled northern Nigerian commercial city that was linked to international terrorist organization, Hezbollah. Addressing newsmen in Kano in its first official reaction since the Hezbollah cell in the city was busted by the security agents, Chairman of the community, Tahir Fadlallah said that the Lebanese Community ‘’unequivocally condemns crime in whatever form”. Tahir Fadlallah, who also doubled as the chairman of the Tahir Guest palace in Kano said that, “with almost 100 years of our stay in Kano, we have never been associated with any crime that threatened the peace of our host”. Tahir Fadlallah said that, ‘’the community is ready and willing to cooperate with security and law enforcement agencies in their efforts to counter any act or activities associated or related to terrorists act”. Fadlallah maintained that,” Lebanese community will not accept or associate with any criminal individual or group”. The chairman further disclosed that the Lebanese community will give their full and unwavering confidence in the ability of the relevant authorities to carry out thorough investigations with a view to bring the culprits to justice. Tahir also condemned in strong terms, the purported newspaper report that linked him and his organization to Hezbollah armoury, stressing that, “I am not involved and I’m prepared to initiate a legal action for redress. I have been receiving calls within and outside the country over the purported story but it’s not true at all as you all can see now. I’m addressing you and will not leave the damage to go like this because I will sue them”. you never can tell.lil wonder wonderland and Amigos looked deserted today. Nice move! Dissociation on point! well a thorough investigation should be done to ascertain if they are involved or not. 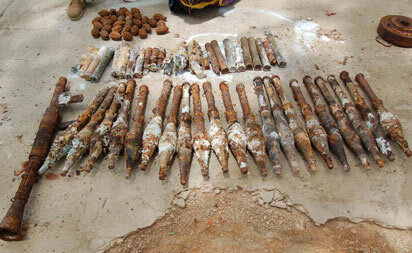 but those groundnut (ammunitions) no be here o! And you think I believe you? If this was in Lebanon, I bet you next week there will be a lot of deported Nigerians heading down here. But it is Nigeria where anything goes, so we keep our hands folded and our mouth shut. Do they even have visas? 100 years?!!! And they give us grieve for wanting to stay a few weeks!! If I hear now,so all na lie. Then how can he explain d numerous arms found in their possession? Story, story,... story! So how then did the armoury find it's way into your property. One problem we have as a country is that we trust too easily and always end up getting stabbed at the back. Get off our shore, bloody terrorists!!! Their country have not being in peace for years now. They want the same for Nigeria. they are involved jaree. Lebanese are very fraudulent in nature. They don't even sell naija products in Amigos super market. I looked for nasco cornflakes that is made in Naija twice they didn't have it. Even park n shop don't have it. Is just foreign cornflakes they have. Which kind rusted ammunition be this? Una sure say these no be leftover from biafra war? HABA!!!!!!!! NA THE ONES WEY FALL FROM OYINBO DIRTY DEM SEE BUY?? @ Anon 10:01 PM, by d time those things on d floor hits ur head u will understand dat bn rotten does not affect its efficacy. K! .....but y u no go wuse market???? They shud not allow dis pple go,they r big thieves.mtcheeeeew. They re all boko haram . Causing problèm anywhere they re . Even here in france lebaness re Always fraud . CORDIAL MY FOOT! LAST WEEK A LEBANESE HIRED A NIGERIAN TO PERPETRATE THE KIDNAP OF HIS AUNT. LOOK MY FRIEND, I DONT KNOW UR CASE BUT WE SHOULDNT IMAGINE THEIR HANDS ARE ENTIRELY CLEAN. SO SHUT THE HELL UP!!!!!! These Lebanese animals are essentially corrupted people!They bring their perverted nature everywhere.Sadly,they own Nigerian politicians and there is nothing anybody can do. Gbam,true talk. Why cnt we tighten our immigration laws...dts if we have any,secure our porous borders? Wats r d customs n immigration officers doing? We shud wake up n know dt terrorism is alive n Living nigeria. Anyone who told us we would b dealing with ds mess 10yrs ago,we wudnt believe dem,by look at us nw. Prayer cnt solve ds,our govt need 2 wake up n start working. Send d security operatives 2 refresher courses on security intelligence,then cnt fight terrorism wtout being versed in modern day security. Those items look rusty. Do they still work? Its can't be entirely false. msheeew,if it was during Abacha,these people would have been bundled out of our shores.